By registering for the current Team League Round, the player confirms that he has read and understood the Rule; he confirms that he will play without gold. Bytro Labs / CoW Community Support reserves the right to control and may remove players who violate these rules from the current round. 1.1 Participation: Participation in league games is open to all those who register in time, who have reached the minimum rank of level 20 and who recognize the terms of Bytro CoW Community Support and the rules of the league. The game management of the league reserves the right to refuse to participate in serious cases of infringements in past league rounds in individual cases. In this case, a message will be sent to Bytro Community Management. 1.2 Gold Rounds: All games in the series "The Dirty Dozen" are played anonymously. The result is an entrance fee for the league games in the amount of 5000 gold, for players of the high command, admission is free. 1.3 Gold Usage: The use of gold is not permitted in league games (CoW Community Support monitors). Players who have accidentally used gold must immediately announce this use in the newspaper (World Herold) and inform the game management. (unreported gold use is considered a rule violation and may lead to immediate game exclusion). The post was edited 2 times, last by Xarus ( Feb 28th 2019, 5:18am ). 2. League System: The Team League will start a new card every first of the month at 18:00 → UTC. The games always run exactly 30 matchdays. End is always the day change to day 31. One season lasts 4 months. A player does not have to play all games for one season. New players can and may join the league in the current season. 2.1 Registration: Logging in to a game of series success every month. There is a sign-up thread in which the player can announce their participation by poll in one of the five teams. The registration ends when all 60 seats have been taken or 48 hours before the start of the game. At the end of the registration, ie 48 hours before the start of the game, the card is created and all players receive the game ID and password, in a new conversation in the forum. Then the registered players have the opportunity to appear on the map before the start of the game. Which then starts at 18:00 UTC on day 1 of the month. 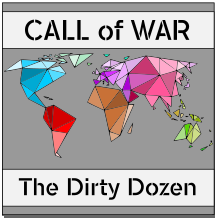 New: The Dirty Dozen is a single player challenge and so we limed the registration for members of a CoW-Alliance. Each alliance is allowed to send a maximum of 4 players and this four players must be all in the same team. 2.2 Entry: Access to the current round must be within the first 24 hours after the start of the game. Then the round is closed and secured by a new password. At the end of the first 24 hours reserve players have the opportunity to replace the missing players. 2.3 Peace phase: The games of the series always have a time of "peace" of 4 days / 96 hours at the beginning. During this time, the players can consolidate their position and coordinate with the comrades. The peace phase also applies to AI nations. 2.4 Team choice: Players have the opportunity to choose one of the 15 Squads. This Squads are small group of players that want to play together as friends. Three Squads will randomly put together to one Team. 2.5 Country selection: The countries are randomly distributed through the game mechanics. 2.6 Points system: At the end of a game, each player receives league points equal to his victory points. These victory points are taken from the World Herald after day switch 30/31. The winning team receives a bonus of 50% on their victory points earned. The second placed team gets a bonus of 25% on their victory points. Example: The player of the Spanish Nation has 460 SP after thirty matchdays and is in the second best team. He thus receives 575 league points. The player of the Egyptian nation after the final 235 points but is in a losing team and thus gets only 235 league points. 2.7 League Points: The earned League Points (LP) will be added during the season. The three best players at the end of the season get gold and free time spent in the army command. All winning players, including the current season's table, will be announced in the forum. 3.1 Right of Way and Shared Map: It is not allowed to offer or accept opponents a right of way or a shared map. The game management does not monitor the NAPs and there are no penalties for breaking a NAP. 3.3 Inactive: Inactive players continue to be considered enemies or comrades. So, the same rules apply as with human players. Reason: The inactive players are still part of the team, so they can not be attacked by active players of their own team. Therefore, we treat these inactive as human players. Info: CoW's mechanics, however, allow this computer of controlled nations, other diplomatic possibilities than human players. So it can happen that these nations grant the right of way to the enemy. 3.4 Trade of resource and money: The trading of resource and money takes place exclusively via the market. The trading among comrades within the team may only be 1: 1. When exchanging money, there is always at least a price of 3 money per unit of a resource. Info: No gifts may be distributed or accepted - abuse will be punished! 3.5 Exchange of units: It's not allowed to exchange units in the team-league, traded or given away, not even with comrades! 3.6 Exchange of provinces: The trade of provinces is only allowed among comrades. 3.7 Espionage: Espionage is possible as far as the game mechanics allow, even in peace phase at the begining. 3.8 Computer opponents: It is not allowed to have / offer the AI right of way or shared map. Exceptions are nations of former players (see 3.3 Inactive). 4. Newspaper (World Herald): Every player is allowed to put an article in the newspaper only once a day. This should be fair play and be fair to a newspaper. → honor rule. Example: The President of Northern Urals begs his neighbor for mercy, may he leave his tanks at home and threaten his cities only with infantry. Info: Forbidden are allegations, slander or provocations. Questions are in the forum or by sending a message to Switzerland. 4.1 Anonymous Articles: Anonymous articles are generally prohibited in the newspaper and are punished by the game management. 4.2 Questions and Answers: Questions and discussions are in the current registration thread in the forum or via official conversation, but not in the World Herald! The post was edited 3 times, last by Xarus: change in point 2.1. (alliance members) ( Feb 28th 2019, 5:17am ). 5. Honor Rules: Violations of an "honorable style of play" can be: "corridor formation", betrayal of the coalition partners, ... Violations of an honorable style of play are punished according to severity; the game management reserves the right to insert additions after the start of the game which result from new situations and thus adapt the rules of honor to the new requirements. In case of a violation of the honor rules, the management of the game can determine the severity of the offense, depending on the nature of the benefit. Violations of the honor rules generally require a "4 eye examination" by at least 2 members of the game management. For more balance between new players and veterans in the game, we hope that all players use the diplomatic inside the game. Please do not use social media like WhatsApp, Skype, Discord or something like this. If all players accept this little thing espionage can be very interesting/helpful. 6. Switzerland: Switzerland is a neutral nation, it is governed by the support and does not intervene in the war, the Switzerland must not be attacked. They are used to play the game to carry out penalties and sanctions. Questions may also be asked directly to these nations. 6.1 Counterpart: Most accusations against other players turn out to be a mistake! Things that surprise you at your counterpart, please clarify between you by means of diplomatic mail between you. If you have the feeling that a player helped with a building with gold and the construction time can not be correct, write to this player and ask him how it can be. Only if you get no or a bad explanation, announces the incident to the game management. 6.2 Support: The members of the game management will check the requests / complaints at least once a day. If claims for complaints regarding detected rule violations are sent to the game management, we ask for the inclusion of appropriate screenshots to ensure faster processing of inquiries. We can not guarantee the constant presence of a Support Member in Game Management / Support. The game will publish rule violations in the newspaper (World Herold) and set deadlines for various demands (for example, transfer of raw materials / money as well as transfer of provinces). The vote in court should not take more than 12 hours. It is the penalty that receives the most encouragement. If there is a tie, the player with the highest rank will decide. The game management reserves the right to suspend the defendant until the verdict from the round. 6.5 Assistance wanted: The game management asks each player during the game operation to document violations of other players and to send to Switzerland. For example, if there are spy infomation that a player is trading illegally, or otherwise doing any crooked business, please report it to Switzerland with a screenshot. UTC → Coordinated world time, the time that is current in London (United Kingdom). Comrade → unknown teammate of your own team. Opponent → friendly neighbor with territorial claims on your territory. Note: This is the first version of the translate rules and standards from the last German league. I hope that my English is good enough to understand the rules. If you find errors in grammar or spelling fell free to contact me. The post was edited 5 times, last by Xarus ( Jan 20th 2019, 10:10am ).